mAh per display square in. 306mAh/sqrin. 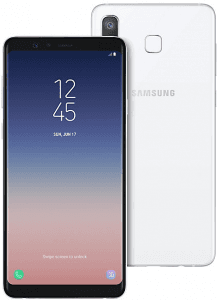 The Samsung Galaxy A8 Star sports a rather expansive 6.3-inch Super AMOLED display with a 2220 x 1080 Full HD+ resolution, while it touts one of the highest-resolution dual-lens systems 2018 has to offer, consisting of a 24-megapixel main cam and a 16-megapixel sub-cam. Besides, it also belongs to the elite (as of its release) group of smartphones that break the 20-megapixel selfie cam resolution threshold, rocking a 24-megapixel cam above its screen. 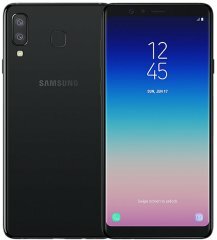 Also known as Samsung A8 Star, Samsung Galaxy A9 Star (China), Samsung A9 Star (China). Pros and Cons Review The Galaxy A8 Star boasts a 24- plus 16-megapixel rear camera and an equally-promising 24-megapixel selfie cam, but it comes with only 64GB of on-board memory. Discover the rest of its pros and cons in this specs-driven analysis. (more) New Samsung phones View all the recent Samsung phones.